The hamster hat is lovingly made and you can style it in 2 ways - one way is by having the brim of the hamster hat rolled up as in picture or by straightening the rim into a normal hat. The black round crochet band with the flower is detachable to have a plain hat or to just use the flower band for the photo shoot! 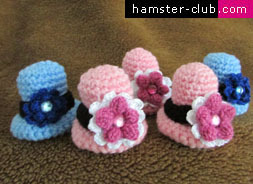 These hamster hats are a must have especially to those that like collecting hamster items...these hats are too cute not to have! They even have the diamond detail in the middle of the flower! Simply adorable! Price:�6.99 & FREE SHIPPING WORLDWIDE.